They undercharge batteries with high internal resistance (due to sulphation or bad connections);They can boost charge a battery too often if an occasional heavy load is applied;Under some conditions the charge current can oscillate rapidly on and off causing annoying flickering if any lighting or other voltage sensitive equipment is connected, This fast switching can cause annoying radio interference. 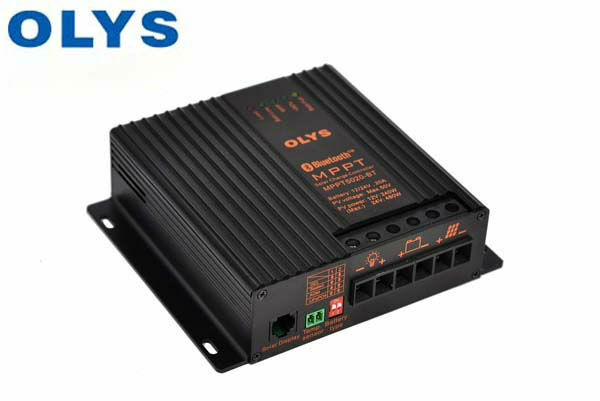 They waste energy in the afternoon when the batteries are full;Voltage transients due to inverters or large inductive loads such as motors can cause incorrect changes in regulator state.Can OLYS controller do better than this? Yes, Imagine a human battery technician was controlling the charging. An experienced operator would not make a decision about battery condition based on only one piece of information (ie. the current battery voltage). The operator would ask such questions as how much was the battery used last night, how quickly did the battery voltage rise, how much charging has taken place today, are the users on holiday, how many days since I last did a boost charge and so on. Having put all the information together, an intelligent decision could then be made. Can we distill the intelligence of a good operator and build it into a regulator? This is what we have tried to do with our MPPT regulator range.